Real Madrid have come in for some strong criticism from Liverpool supporters for wearing a shirt that Reds fans feel shows a lack of respect. 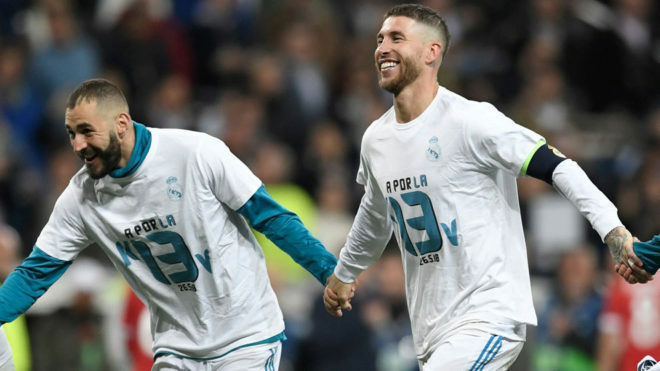 It carried a message ‘A pfor la 13,’ hinting at Real‘s 13th Champions League, which is the prize on offer in Kiev on May 26th. Serving as an extra touch of motivation for Jurgen Klopp’s side, The Mirror note that Liverpool are comparing it to when Milan’s players were touching the trophy at half time in the final in Athens, convinced it was theirs. At that stage, the Rossoneri were 3-0 up but Liverpool famously came back to win on penalties.